The politics in Islamabad today is posited by the opposition as a battle for civilian rule and the confinement of the Pakistan army to its constitutional role. The lawyers’ community and the opposition political parties may have different agendas up their sleeves, but at the declaratory level it is the civilian-military relationship that everyone is supposed to be trying to correct. Even the ruling party, by keeping a general as president, promises a more reliable reversion to more democracy. The consensus is apparently shared by President General Pervez Musharraf himself. But the antagonists fall apart on whether the post-Musharraf period should be “transformational” or “transitional”. A Pakistani scholar has tried to “define” the character of the Pakistan army in his forthcoming book. A journalist and an ex-IMF officer, Shuja Nawaz, in his Crossed Swords: Pakistan Army and the Wars Within (not yet published), compares it to the army of Indonesia under Sukarno and Suharto instead of the Turkish army as is often done by those who wish to posit a polarity between the army and the people. He explains that “the army has gradually expanded its remit to include protection of the national ideology, as defined by the army itself. He said this ideology has changed from a loose definition of a Muslim state at birth to an Islamic polity under Zia-ul-Haq, and now to the ‘enlightened moderation’ of General Pervez Musharraf, even as the growing urban population appears to prefer the conservative end of the social and political spectrum”. 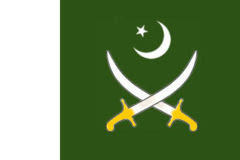 The Pakistan army was a professional outfit in the beginning. It accepted the challenge of an anti-India nationalism after the 1947 war in Kashmir and was supported by the country’s civilian leaders. Early Pakistani nationalism was based on the warlike self-image of the subcontinental Muslim, thinking nothing of the strategic mismatch with a much larger and “unconquerable” India as “the other”. This army embraced a tactical worldview during these early years, which in time became a part of its persona. It overthrew civilian governments in a politically conflictual early phase to carry out the anti-India mission it had been bequeathed by civilian leaders but suffered defeats at the hands of India. After the Pakistani mind began to regard the army as a defeated/discredited entity usurping political space, the army clutched at the “ideology of Pakistan”, a much safer route to its fundamental mission of fighting a “just war” with India. It did so after the last testament of Pakistan’s anti-India nationalism was framed by Prime Minister Zulfiqar Ali Bhutto in his book The Myth of Independence (1969). He reaffirmed confrontation with India as the “grundnorm” of Pakistan’s foreign policy: “1) That the US is in a position to compel both India and Pakistan simultaneously to an arrangement compatible with its own global interests; 2) that the US thinks that its detente with the USSR, coupled with China’s continued weakness, will strengthen its power over Asia; 3) that the US and the USSR are acting in concert to force a settlement between India and Pakistan, which will effectively force Pakistan to accept Indian hegemony in the region; 4) that the US seeks peace between India and Pakistan to use them against China”. Author Shuja Nawaz says: “It is important for the army to help create a stable national polity by subjecting itself in practice to civilian oversight and control ... [and] on its side, the civilian government needs to ensure that it follows the Constitution fully and does not involve the military in political disputes.” He warns that while the army remains a conservative institution at heart, it is not yet a breeding ground for large numbers of radical Islamists that many fear.